Humans at one of our most basic levels are builders, and gaming offers a wide variety of opportunities to experience the push of civilization building over time. It’s no surprise then that one of the big genres a lot of board, card and even video games fall into is civilization development. The combination of historical facts and the linear nature of societal advancement through the ages lends the subject to a wide variety of games. Gamers return again and again to the chance to play out the evolution of technology, philosophy, warfare, religion, agriculture and art. Sid Meir’s Civilization, Small World, Settlers of Catan, Clash of Cultures and Tzolk’in are just a few of the games I’ve played that fall into this broad category, both historically-based or set in a fantasy realm. This past weekend at Metropolitan Wargamers, a few of us played through Innovation, the 2010 award-winning card game from Asmadi Games. Retailing at $20, the game consists of 105 unique and text-heavy cards played against a simple set of rules but with a lot complexity in keeping track of your own civilization’s innovation track. Like most civilization building games, Innovation proceeds along a linear timeline from the Stone Age to the Modern Era. 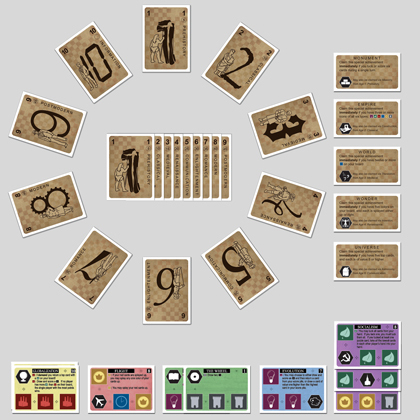 After starting with four cards laid out in front of them, each player chooses two actions in each turn: Draw, Meld, Dogma or Achieve. Cards are drawn from chronological eras numbered 1-10 with cards depicting progressively-advanced innovations. A meld action allows a player to play a like-colored card on top of a card already laid out in front of them. Melded cards supercede the innovation on the cards previously played underneath. The dogma action is where the meat of the game takes place. Each dogma allows a variety of single or multiple actions that can affect not just the one player but other players displaying equal or greater numbers of symbols such as crowns, factories, lightbulbs, castles, leaves, etc. Dogma actions can result in additional drawn or discarded cards, taking cards from other players or fanning the pile of cards to the right, left, up or down. As cards are collected and scored, players can take an achieve action to score a level of era achievement for their civilization. Some dogma actions allow a combination of cards to be used to score special achievment cards such as Monument, Empire or Wonder. The first player with five achievements wins the game. As with most civilization development games, Innovation involves a lot of balance between charting your own progress while keeping an eye on the advancement of other players. Certain dogmas are extremely valuable in moving your civilization forward, but they may also assist the other players, too. This combination of collaborative and competitive play allows Innovation to mirror the arc of human societal development as the ebb and flow of alliances and strength can shift from turn to turn. Innovation is deceptively easy out of the box, and it’s only through a play through a game or two that the true complexity is felt. Unlike other civilization games which can often involve managing hundreds of pieces, charts and cards, Innovation’s simple card mechanic is one of its strongest points. The devleopment of human civilization has been a complex road for sure, but with Innovation the road doesn’t get bogged down in a big box of stuff and all the strategy you need is right there in the cards.